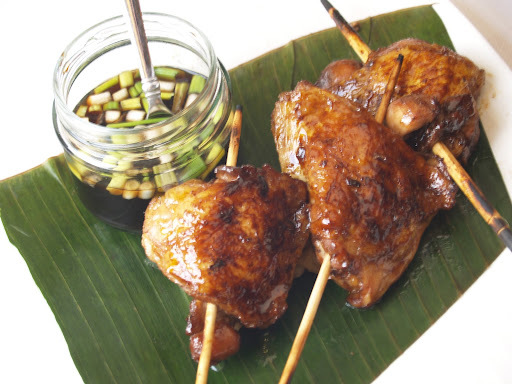 SKIP TO MALOU: Chicken Inasal (Grilled Chicken): the next Filpino food truck phenomenon? Chicken Inasal (Grilled Chicken): the next Filpino food truck phenomenon? "I wanted to surprise you - Surprise!" he mumbled. My heart fluttered. It was one of those moments that make your heart smile. "Are you happy to be home? ", he asked. I realize how much fun I had the last 6 weeks, and I begin to realize that the words "of course" were only partly true haha. And for the next few days, I (over)used the word "jet lag" for those days that I slept in all day. Until a month has now passed... A month? Really? That's how I've been the past few weeks here. I'm just happy that my hubs didn't eject me like an old 80's mixed tape. Nor did he ship me back to the Philippines for not being my usual self. My kitchen has been quietly waiting for me to switch on the stove top. Take outs were the norm for most of those days. That being said, I would like to apologize to my Kulinarya buddies, as my April post is a tad late. But I didn't want to miss out on this one. The challenge posed by Louie Yan of East and West is to take a Filipino standard and make it into a street food dish easily peddled through food trucks. 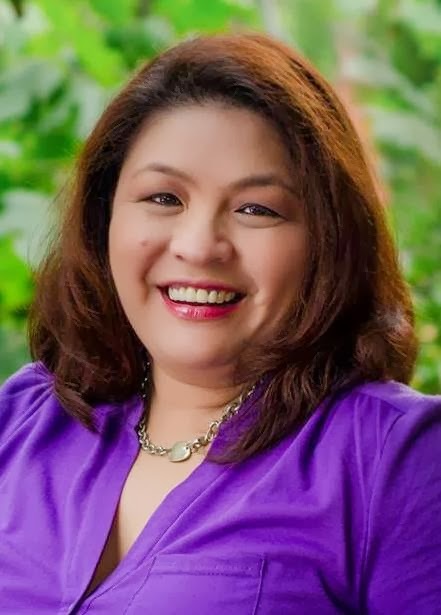 I know that Filipino food is slowly getting out there, because Filipino food trucks across America are doing its work plying the streets, spreading Filipino food around. With that in mind, I would like to introduce Chicken Inasal (grilled chicken) as a future food truck phenomenon. 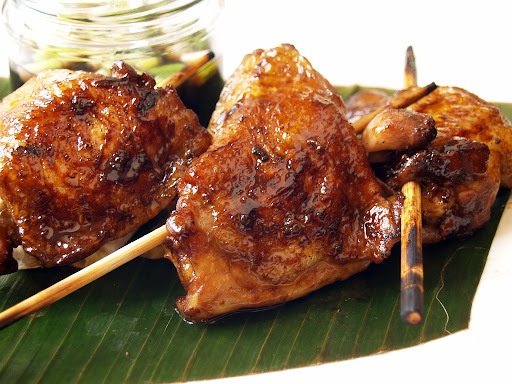 Chicken Inasal, is special blend of grilled barbeque chicken, popularized by the Ilongos. The secret of these irresistable chicken pieces skewered in bamboo sticks is not only in the marinade but also the spicy sauce on the side. The marinade is simple but the details such as the basting of atchuette oil (annato oil) while the chicken pieces are being cooked over glowing crimson coals make the difference. Mix all the ingredients except the chicken in a pan. Simmer for about ten minutes. Let it cool. Separate a portion for basting. Marinate the chicken overnight or for at least an hour. Grill chicken pieces until it's thoroughly cooked. Mix the two ingredients together. Baste the chicken as needed. Mix all the ingredients together. Stir and serve it together with the freshly grilled chicken. Oh by the way, grilling this chicken will definitely make a food truck rock... people will be raring to buy because the aroma will lead them where the food truck is parked. Cheers! I think it will definitely be a hit in the US... why not. Inasal places are all over the Philippines and people really patronize it so I think it will make the mark. thank you for the swift comment hehehe. I bet it could pass the grade no? Thanks again for being here. This chicken inasal was cooked perfectly and will definitely a number one seller in the food truck menu. Hello Ray! How's it been. It's been awhile.. sige I'll come up with a food truck na ng chicken inasal haha. why do we have to simmer the ingredients for chicken inasal ?what's atchuette oil (annato oil) any substitute for it? thanks ! hi there. I simmer the marinating ingredients together to fuse in the flavors. Make sure to let it cool before you pour over the chicken. Atchuette oil could be made by sauteing garlic and annatto seeds in a cooking oil. You could also add bay leaf to add a little flavor. Paprika could be used to replace annatto. Delicious looking chicken! Love the flavors! I can almost smell its yummy goodness! Must-try! hi iska, great to meet you! I'm glad I was able to deliver a 4D pic hahaha.. that's how my sister describes a picture that you could almost smell it haha! Thanks! Im glad I was able to take you down memory lane. Happy as always to have you! These flavors are fantastic! I can just imagine the amazing aroma...I agree, this would be a huge hit on a food truck :) And I must try this dipping sauce...delicious! Glad you had such a wonderful trip and happy to see you back, hugs! Alisha, yay GReat to have you back. I miss having you around... your sweet words always give me a lift. Happy weekend! I must get some lemongrass - there's a bunch of stuff I want to try and I cannot find it. Coconut vinegar? That's new to me also! So much fun! So much to explore. I seem to have jet lag until my next trip - even if it's a year away! You could use your white vinegar, or if you have lemon, you could use that instead. I hope you could try making them and would love to know how it turns out. Hi Orlyjr, Welcome to STM my FB friend. It was a pleasant surprise to see your comment here too. You don't know how thrilled I am :) I hope to see you around! Oh I love chicken inasal, Malou! I've eaten a lot of it when I used to visit Bacolod! Would love to see it in food trucks here! Tina, Sorry for the late reply but salamt for coming over. THis is a Kulinarya event and glad that there are bloggers in the Kulinarya like you pa rin who come and visit. Maraming salamat sa yo! Great idea for a food truck item! Or my kitchen, actually. Wonderful combo of flavors. Really good post - thanks. it's equally a good idea for the kitchen and for the food truck. Yesss! Thanks for coming over. I was so thrilled to read the first sentence but when i realized that it was in BGC i sighed because I can't go as I am based here in STL. I wish this happened while I was there in the PHilppines for 6 weeks. OH well... sayang. but i will let you know when i get there. thanks for the invite. hello hazel, salamat. i had it again today hihihi. sarap! Such a beautiful chicken dish. Almost looks identical to my King Pao chicken I posted previously! I must make this amazing recipe, beautiful presentation, as well! Malou, I haven't heard from you for a long time. I know you've been away to visit with you family, been checking out your latest, but haven't commented either. Can't not just visit and not say hello to you! You know what's so funny is that yesterday, I was on my way to visit you but i got distracted. This morning I thought about you and meant to visit you today and i get this. Isn't that cool... we're so connected hahah. Thanks for dropping over. Now Im skipping over at your place. i can not wait to try this amazing recipe, all i wanted is simple yet super good food... thank you ate malou for sharing your talent.